The very best for your Cockatiels! Cleaned and packaged to the same exact specifications as the Goldenfeast Gourmet Line. 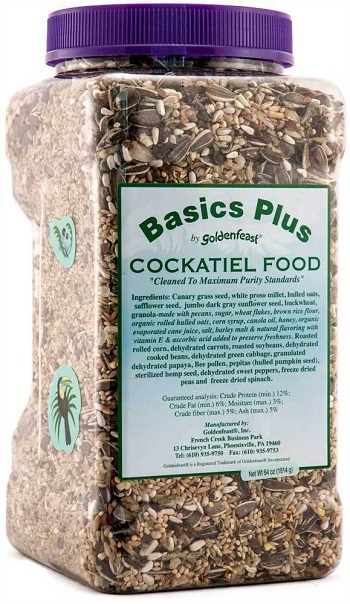 Goldenfeast Basics Plus Conditioning Cockatiel food has No preservatives and No added dyes. Contains many of the gourmet ingredients used in our Goldenfeast Gourmet Blends. Ingredients: Canary Grass Seed, white proso millet, hulled oats, Safflower Seed, Jumbo Dark Grey Sunflower seed, Buckwheat, granola made with Pecans, sugar, wheat flakes, brown rice flour, Organic rolled oats, corn syrup, canola oil, honey, organic evaporated cane juice, salt, barley malt, roasted rolled corn, dehydrated carrots, roasted soybeans, dehydrated cooked beans, dehydrated green cabbage, granulated dehydrated papaya, bee pollen, pepitas, sterilized hemp seed, dehydrated sweet peppers, freeze dried Peas and Spinach.